Food Costs > How Much Does Arugula Cost? Arugula is a Mediterranean plant, which is low growing with flowers that have yellow-white petals and leaves that are dull green, pungent, and peppery. The arugula has been traced all the way back to the Roman empire when it was grown and used as an edible herb. For centuries, arugula has been part of dishes and now is most often used as a favorite addition to salads, pizza and pasta to add a zippy taste. The cost of arugula depends on where it is sold, the quantity and time of year. Arugula, on average, is going to range anywhere from $2 to $5 per every seven to ten ounces if it were to come inside a plastic container. By the cup, it should be inside the $1 to $3 range, but by the pound, the costs of arugula can be between $6 and $10. If you were to buy it by the bunch, it will often be $0.75 to $1.50 each. At Trader Joes, organic arugula is sold for $2.69 for every seven-ounce bag. The price, however, varies per region. For instance, on the West Coast, a seven-ounce package of arugula is sold at $2.29 while the same product is sold at $2.49 in the Midwest and Southeast. In the East Coast, a seven-ounce bag of arugula is sold at $2.69. According to this 2015 Maine Organic Farmers and Gardeners Association, the retail price of arugula was $9 to $12 per pound, whereas a bunch was about $2.50. Arugula sold at a local grocery store will often come in either a clear plastic bag or plastic container. Depending on the variety, it may be labeled as USDA organic and will, at a minimum, be washed. In some cases, it may be tripled washed such as the Marketside brand at Walmart. While most will say it’s ready to eat out of the bag, it’s still ideal to wash it before consuming. Arugula tends to be rich, nutty and has a peppery taste. One cup of raw arugula will have about five calories and less than one gram of protein, sugar, fat and carbohydrates. Arugula grows best in cool weather. You can start planting it in your backyard as early as April. You can plant arugula in a container if there is not enough space in your garden or backyard. Arugula, according to Mercola.com, is an excellent source of fiber, vitamin A, C and K, calcium, magnesium, iron, phosphorus, and potassium. Dr. Axe says it can help fight cancer, protect your eyes, improve your heart, help you maintain stronger bones, aid with weight loss, improve your digestion, prevent diabetes, reduce skin inflammation and act as a natural aphrodisiac. Store the leaves between a clean paper towel, roll gently and store inside a tight plastic bag inside the refrigerator. The quality starts to diminish after three to five days. Try to consume immediately after buying. 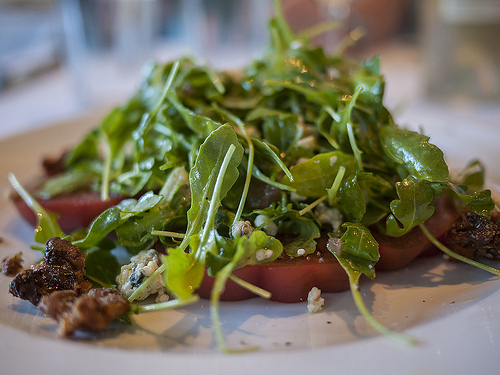 Arugula can taste great on its own, either cooked or raw. It can also substitute cilantro or parsley if it was called for in a recipe. As noted above, arugula works well with pasta, sandwiches, soups, wraps, tomatoes and goat cheese with olive oil. When buying at the store, always make sure there are no signs of wilting or spotted colors. You can save money by planting and grow your own arugula either indoors or outside in a garden. Amazon, for example, has a variety of seeds for less than $2. The plant will perform the best in the early summer in the shade. A farmers market, most of the time, will be cheaper than your local grocery store. If you have one in your area, check it out to see what the locals are selling it for.